I was very taken with Luke Meddings’ recent blogpost about the tensions between education and big business (amongst other things). He suggested that whereas we teach to reach students, to help students reach their potential, others see teaching as a form of investment, a money-making opportunity. It was not difficult to agree with his heartfelt plea for less ‘interference’ in the (language) classroom. Confusing, no? I made a little videoblog (or Vramble = video ramble) on the subject. Very naive. Recorded on nothing more hi-tech than a Flipcam (the fancy microphone wasn’t connected)…. What’s your view about all this? I’d love to know. Then perhaps I’d know what I thought too! I had always thought that if I got an invitation to go to Israel to work with teachers and students there I would refuse. Israel, the big bully of the Middle East, building, by force, settlements on Palestinian land they are not entitled to; carving a great big wall through territory they have no right to; using maximum force in densely populated areas where civilians are, of course, slaughtered in their hundreds; boarding peace convoys in international waters so ineptly that people died. But I know, too, that Israel is the target for rocket attacks, and that not all the Gaza flotilla personnel were peace-loving saints; I know that Israelis – innocent Israelis – have been killed by rockets, in restaurants and in buses. That all Israelis have a well-founded fear for their safety. But still. They way the Israeli military behaves, with its daily humiliations of Palestinians and murderous retaliations for any wrong done to it strike most people I know as unacceptable in every way. As a boy I thrilled to Leon Uris’ great saga of Zionism, Exodus, which told of the founding of modern state of Israel. 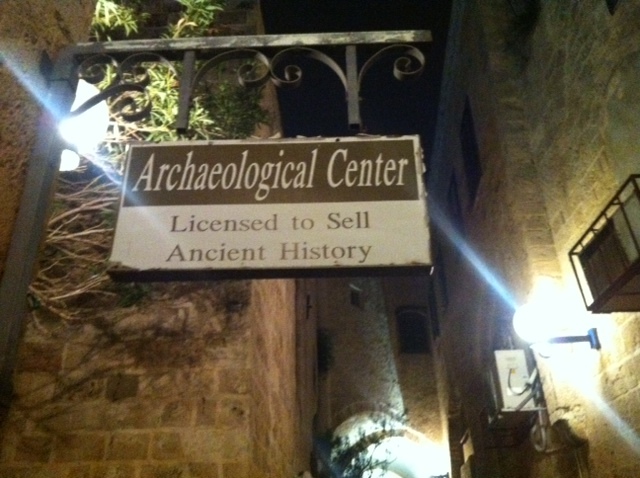 Only later with populist books such as O Jerusalem! by Larry Collins and Dominc Lapierre did I begin to understand at what price this state had been born and about the ineptitude and culpability of the British for the great mess of the Middle East. It takes time to see things clearly. Two of the most moving and meaningful books/plays I encountered in the 1990s were Inherit the Truth by Anita Laski Walfisch (about the cellist’s amazing survival, with her sister, in the horrors of Auschwitz – where she played in the camp orchestra – and Belsen) and My Name is Rachel Corrie (a play based on the writings of the 23-year-old American who was murdered by an Israeli bulldozer driver as she tried to stop a Palestinian family’s home from being obliterated in yet another rapacious piece of land-grabbing). It’s complicated, see. And anyway, perhaps, “History should never be regarded as a zero sum game…the past is mostly far more nuanced than a simple battle between good and evil” (Harmer 2011:255). At the time of the Gaza Peace Flotilla fiasco conversation erupted on Twitter and in Mark Andrews’ blog provoked by the visit of IATEFL patron David Crystal to speak at the ETAI conference. Some people thought that, given his ‘official’ status in our organisation it was not right for him to speak at an Israeli teachers’ conference. David Crystal himself argued passionately (in conversation), that ‘if I refused to go to places where I disapproved of that country’s governments I would never go anywhere’, and that it is always better to engage in conversation than not to. I found him (as so often) persuasive. In the end, my invitation to Israel came not because I am a teacher trainer/writer, but because I perform shows with my colleague Steve Bingham, and the British Council in Israel wanted us to perform our show about Charles Dickens there. And though my inclination was to say no (see above), I found that such a position would be (a) too self indulgent, (b) hypocritical for someone who, like David Crystal, has been to countries where I really really disapprove of what the government does there, and (c) a wasted opportunity to understand more – you really DO need to ‘see for yourself’ sometimes. Governments are not the same as people. Teachers and students all over the world are – teachers and students. Two other factors combined to help me make the decision to say yes: I really like doing shows – that’s the selfish one – but/and The British Council has offices in Ramallah too, and maybe, if we did the Israel gig we would get invited there. And so off we went. And did the shows. They seemed to go really well, especially at the Arab Academic College in Haifa, where (do we flatter ourselves too much here?) two groups of Arab Israeli schoolkids, who joined the teachers and students in the audience, were really bowled over by hearing original Dickens accompanied by Steve Bingham’s wonderful musical artistry. It might have made a difference. You forget, sometimes, that Israel is 75% Jewish, but that other ethnicities and religions inhabit the compressed region within its (sic) borders. As one taxi driver told us, ‘I am Israeli, I am an Arab, This is my country. The Jews came and took it, but they are nice people I like them’. Another Arab Israeli teacher was less accommodating, saying that by the time they (the Israeli government) had finished annexing all of Jerusalem there would be no chance of a final solution (she used the term unironically). Guess what! I met some incredibly intelligent, kind, socially conscious and engaging people in Israel. Mostly (but not exclusively) teachers, they were just like other incredibly intelligent, kind, socially conscious and engaging educators I spend my professional life with. Like many other visitors to Tel Aviv, I thought what a great place it would be to live – if you could forget at what price it had been made, and what lengths the country goes to (has to go to?) keep it happy. I met all shades of opinion in Israel: the lunatic rightwing American who told me that the God of Abraham and Isaac was out to get me after I refused to sign a petition to say that Jerusalem should be 100% and only Jewish; the settlement defenders; people steeped in the ‘either them or us’ mentality; but people too, many people, who deplored the wrongs done to Palestinians but who, nevertheless approved of the wall, the ‘green line’, because there have been no bombings since and ‘my children can get the bus to school in peace’; people who only escaped being bombed in restaurants by chance; a mother who was appalled that her son was going into the military because he might end up at the checkpoints humiliating Palestinians ‘but at least it will be him…we have taught him to question everything…rather than some other redneck’ (sic); the young teachers in training worrying (like all teachers in training) how to do their very best for the kids with learning difficulties that they were trying to help. And what I, as an outsider, mostly learned was that Israel is not/will not go away anytime soon. Whether other people like it or not, Israel IS going to continue to exist. That it is full of ‘us’ too and that some of ‘us’ are pretty good people and some of ‘us’ are nasty thugs. Not much of a revelation I suppose. But the craziness of Israeli politics – a system that ensures no government ever has sufficient power to REALLY do something (like make peace) – the debilitating indoctrination that military service offers (the Arab Israeli taxi driver would never go to the army ‘to kill my brother Arabs, but now they are killing each other! Arabs! It is a crazy world.’), and the impossibility of getting anyone in the region to agree about anything…all that does not provoke much optimism. So what can you do if, like me, you have no power or importance? And here they are playing the Adagietto from Mahler’s 5th symphony, one of the greatest love songs ever written. My name is Jeremy and I am a conference addict. Phew, I’ve said it. Now I can set about my recovery perhaps. 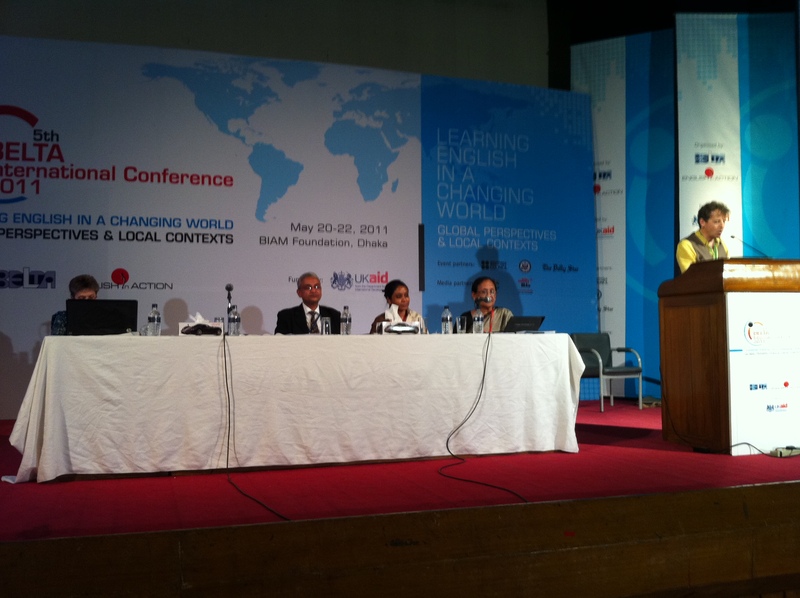 I have just come back from the BELTA (Bangladesh English Language Teachers’ Association) conference in Dhaka. It was jointly organised by English in Action who, together with The Open University, and the BBC are involved in a massive nine-year project to improve the English of 25 million Bangladeshi students. The conference was beautifully organised and enthusiastically attended by a few hundred teachers from universities, teacher training institutions, and secondary and primary schools, both government and private, both rural and urban. The presidents of the teachers’ associations from Afghanistan, India, Nepal and Pakistan were also present, together with visitors from those and other countries. But it was (unsurprisingly and overwhelmingly) a Bangladeshi conference. The distribution of plenaries (often a source of contention) seemed about right to me. Four female speakers and four males. There were two British speakers (myself and Huw Jarvis), one American (Christine Coombe current TESOL president), Amol Padwad from India, two speakers (Sabiha Mansoor and Zakia Sarwar) from Pakistan, Arifa Rahman from Bangladesh and Malachi Edwin Vethamani from Malaysia. The whole thing kicked off with David Graddol’s keynote updating us about his work on the status of English around the world. Rather than describing the sessions in detail it seemed worth setting out the questions and themes (big questions and themes) that ran through the three days and which made this conference significantly different from many that I go to. What is the correct approach and methodology when facing classes of 150 (and sometimes more) in unattractive physical conditions? Why has CLT (communicative language teaching) apparently failed in Bangladesh? Is it because no one quite knows what they mean by it (that’s not special to Bangladesh by the way)? Or perhaps it’s inappropriate anyway? What’s the point of talking methodological change anyway when governments produce tests which militate against such change? But what’s the point of complaining about the situation unless you are prepared to try and do something about it? How important IS English really? Is it the killer language of the linguistic imperialist commentators nightmare? In Pakistan, for example, the issue seems to be far more centred on the way that Urdu predominates to the apparent detriment of home languages such as Gujerati, Punjabi, Sindi etc even though they may actually have more speakers. Because, gosh, language is a political issue always (think the Soweto riots for one). It was the Bengali Language movement of 1952 (fighting against the imposition of Urdu) that led inexorably to conflict and finally to the foundation of Bangladesh in 1971. Bengali ‘became’ Bangla and it is the official language. But does everyone speak it? Intense informal conversation over three days centred around whether what people speak at home in the regions (such as Syhlet) were dialects or languages. More of a political question than an applied linguistic one perhaps. And what about English? Will it really lead to socio-economic progress? How well do you have to speak it to take advantage of any perceived benefit? C!? C2? Is teaching English, in a country like Bangladesh, a contributor to an even greater urban-rural divide (because some have good learning opportunities and others less so)? Does Teaching English privilege elites? Or perhaps, to put it another way, what, in reality, will some areas of rural Bangladesh actually gain from learning English? And that leads on to the last big question. How do you help improve teaching standards on such a big scale? What is the best way to spend a lot (a lot) of aid money? Perhaps it resides in materials creation? Or perhaps the money would be better spent teaching English to teachers? Or perhaps in setting up local, locally run teacher development initiatives? (How do you keep people in Continual professional development (CPD) mode anyway? What’s the carrot? Where’s the stick?) The methodology matters here because huge-finance initiatives can fail big time when they are inappropriately administered. There was a lot of other stuff too, of course. The British Council talked about using cheap non-smartphone technology, setting up rural IT centres for example, but these are, to me, less important than some of the big questions I’ve talked about above. I’d love to hear your comments. Of course I would.